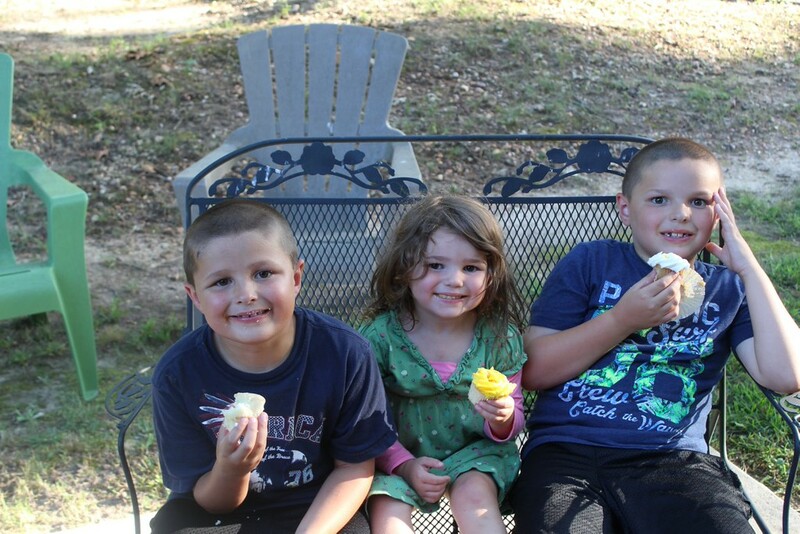 Cupcakes on the back porch! This morning it didn't take me too long to realize that Robby and I were the only ones that were still asleep this morning. Graham did join us in bed pretty early which caused Robby to end up in the floor but that didn't matter-we were all still sleeping well when we should have been up and moving. Things did calm down some after lunch-actually they calmed down quite a bit. We put away the kindles and the kids started playing fairly happily. My Campbell started on her kindergarten work-she was able to wait no longer. She did quite a bit of her first day of work today-her reading book, a reading page, math, phonics, handwriting, a sight word page and a fun drawing page. I think that she just has spelling, a skittles activity (I need to buy skittles) and a map puzzle left. She was so proud that she left her work out for Robby to see when he got home. The boys ended up outside for a bit this evening and then it was supper time. After supper I had the kids clean up a little bit before sending them all to the patio so they could finish off Graham's birthday cupcakes. I really should have everyone eat back there for every meal-maybe I need to move the picnic table there-it sure would mean a lot less sweeping for me! The kids watched an episode of Ninja Warrior and then it was bedtime for my crew. They were pretty wound up at bedtime but hopefully they will sleep well!